It's a long time since I've been able to go out sketching, but Saturday was the day to ease back into it. We went to Darling Harbour near the Maritime Museum - one of my favourite spots. First we wandered round aimlessly deciding what to sketch. We tried going down near some of the smaller boats, but it proved to be a floating pontoon I stepped onto and the chop on the harbour nearly threw me off my feet. Finally we just plonked down right where we were. There's something to see everywhere you look in that area. 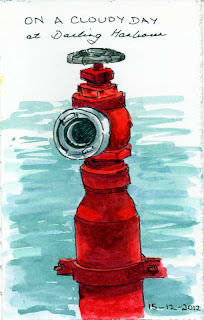 Strangely, right in front of us was this fire hydrant. With my fascination for sketching machinery, off I went. It was a cloudy day - great sketching weather in fact. It was hot, so had the sun been out we would have been scrambling for shade.